A couple years ago, we wrote that we had found the best-ever mobile internet solution for our boating and RV adventures – The “Moovbox” from SinglePoint Communications. We have used our Moovbox on both our boat and our RV over the past couple of years, and it has performed brilliantly! But, time and technology march ever forward and it was only a matter of time before something better came along. 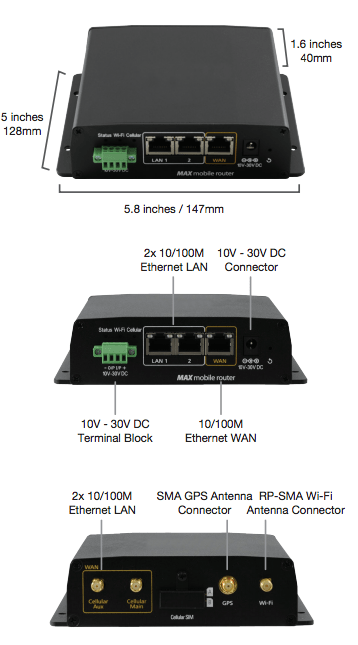 Now, SinglePoint Communications has a new family of “WiFi In Motion” solutions specifically for RVs and boats. Their “WiFi In Motion – Max RV” and “WiFi In Motion – Max Marine” solutions are comprehensive – including routers, antennas, mounting and wiring hardware, and even competitively priced service plans – all from one source. 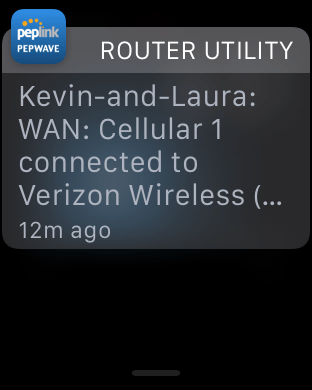 SinglePoint has partnered with PepWave for the router part of the solution to develop capabilities that are tailored to the RV and marine crowd. We’ve been testing Max Marine the past few weeks on Airship as we cruise the San Juan Islands, and our initial experience has been superb. We were skeptical that we could be persuaded to replace our Moovbox this soon, but at this point it looks like the new WiFi In Motion – Max Marine has bumped Moovbox from our upcoming Alaska expedition. As those who have followed this blog for awhile know, we’ve tried a lot of internet options over the years for our work-from-the-road/water lifestyle. Since we spend the majority of our time traveling while working and running an internet business (and this blog), our mobile internet setup is mission-critical for us. So, what about Max Marine moves us to retire the Moovbox? First, there is WiFi speed. 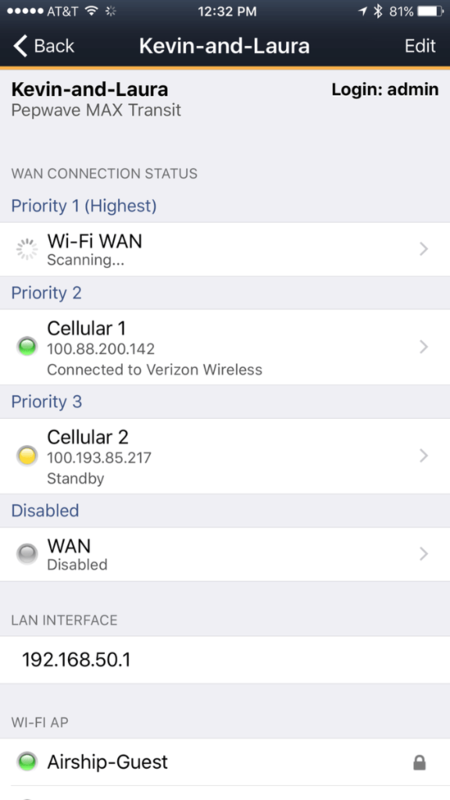 Max Marine supports the latest WiFi standards, so the local WiFi network (assuming your client devices support it) can take advantage of significantly faster local speeds. Yep, you are reading that right. 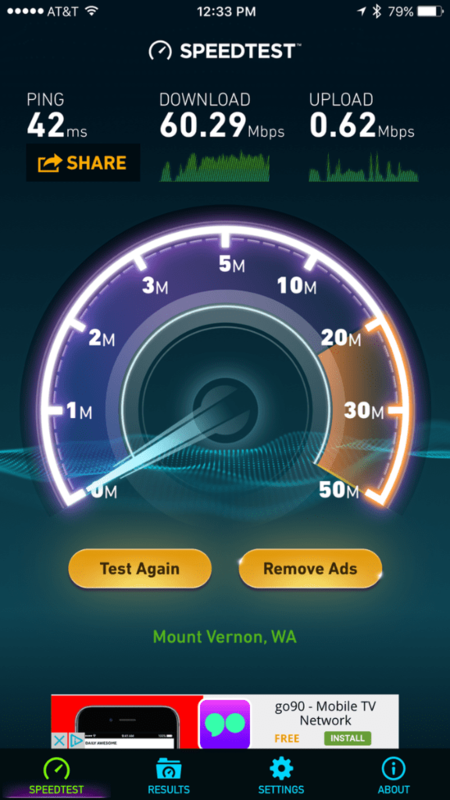 60.29 Mbps download. Upload was unusually low on that particular test, (it is usually in the several Mbps range) but download is generally the most important factor for most people’s use. Third, ease of use. The admin console on the Max Marine device is easier to use, clearer, and more capable than we had with the Moovbox – including a number of features that we either did not have or could not find on Moovbox. Fourth, WiFi as WAN. This is a big deal. 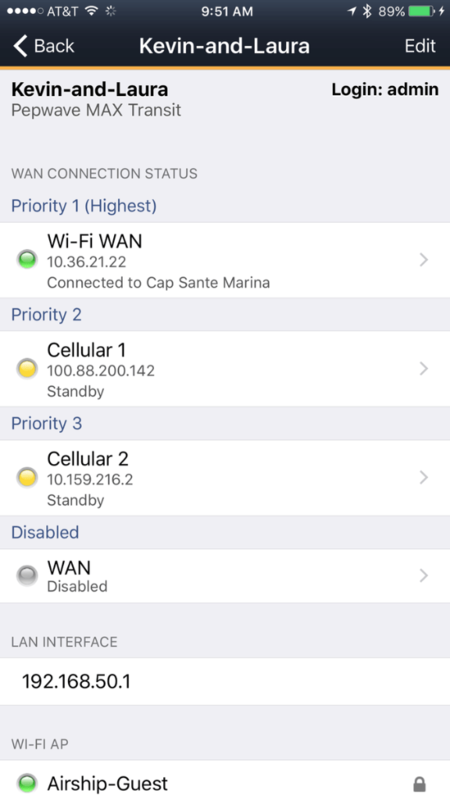 It means you can introduce your Max Marine/Max RV router to the WiFi in the marina or RV park, and the system will use that for an internet connection if it’s available, automatically falling back to your cellular data plan when you pull away or the Marina/RV Park WiFi is unavailable. This lets you save data from your data plan, using it only when other WiFi is not available. 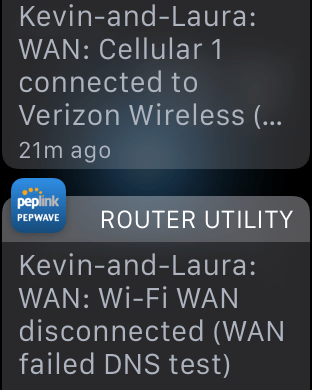 So, why use your Max Marine/RV to connect to marina/park WiFi rather than just connecting your devices directly? The Max Marine/RV is using an external high-gain antenna, so it will have stronger/faster signal (often a huge problem in parks and marinas when the antennas are far from where you are parked. If there is a charge for the WiFi service, you only have to pay it once, and all your devices can share a single connection. You have your own secure, fire-walled network so you won’t get hacked by any bad guys who happen to be on the same marina/park WiFI. 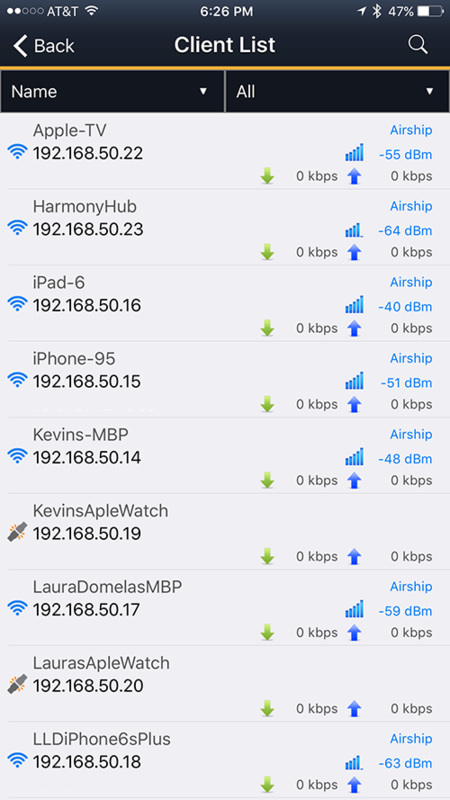 And, you don’t have to reconfigure all your devices – they can continue to just be connected to your own local Max Marine/RV network, even when you’re using marina/park WiFi. Here is our device connected to marina WiFi. Then, when we cruised away from the marina out into the San Juan islands, Max Marine automatically transitioned to our Verizon SIM card. Fifth, unlike Moovbox, Max Marine/RV allows you to easily swap and manage SIM cards. Going to Canada and want to buy a local SIM and pop it in? No problem. Got one of those old grandfathered unlimited-data Verizon SIM cards/accounts? (We do). Just pop that card in for unlimited data awesomeness. (We did, it was awesome). Or, if you have a T-Mobile account that doesn’t charge international roaming, slip that baby in when you head up to Canada. The plan provided by SinglePoint is (we believe) served by Verizon. In our experience roaming around the country, Verizon has had the best coverage – particularly in remote areas. The only exception we’ve found to this was SE Alaska last summer, where AT&T was the clear winner. Sixth (and we haven’t tested this yet) you can easily set up a “captive portal” that would allow your friends or traveling companions use your connection to check their e-mail on a limited basis, without fear that they’ll clobber your data plan or have access to your private network. This feature might make you the most popular RV in the trailer park. Finally, the box is smaller and lighter than the Moovbox – and appears to be similarly rugged, with an all-metal enclosure and high-quality connectors. One question people often ask us is – why spend money on a heavy-duty solution like Moovbox or Max Marine/RV rather than using one of the available mini-routers like Jetpack, MiFi, etc. There are a number of advantages (most of them listed above) but the most compelling for people like us who camp and boat in remote areas is range/coverage. The combination of external high-gain antenna, high-quality radios, and the ability to use SIM cards from multiple carriers, you’ll get internet in a BUNCH of places that your MiFi won’t reach. The antenna alone is a huge deal, since many RVs and boats kill a lot of signal just because the device is inside with no external antenna. The high-quality solutions also bring “real” full-featured WiFI routers that can handle a large number of devices and provide true firewall security – unlike most of the small portable solutions. We’ll report more as we stress test our WiFi In Motion Max Marine over the summer – traveling up the Inside Passage through British Columbia to SE Alaska. By the time we’ve done that, we’ll have a lot more first hand experience to share.